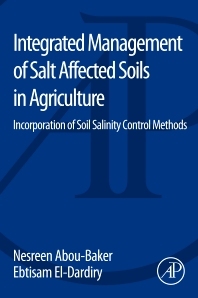 Integrated Management of Salt Affected Soils in Agriculture is a concise guide to evaluating and addressing soil issues related to saline content. Methods focused, the book combines agricultural and soil-based insights to efficiently remediate salt-affected soil. Environmental stress conditions such as salinity have a devastating impact on plant growth and yield, causing considerable loss to agricultural production worldwide. Soil salinity control prevents soil degradation by salinization and reclaim already saline soils. This book will help develop the proper management procedures, to solve problems of crop production on salt-affected soils. Dr. Nesreen Houssien Abou-Baker has obtained her Ph.D. degree in 2008 from Natural Resources Dept., African Research and Studies Institute, Cairo University. Since 2004, she is actively working in National Research Centre, Egypt, till now. She is an associate professor in Soils and Water Use Dept., has gained twenty one training courses and teaching in summer training course for science faculty’s students, published some articles and eighteen scientific research papers, worked in ten projects funded by Egypt, France or China and participated in sixteen symposiums, nine workshops and ten conferences. She is a member of nine scientific societies and a reviewer of four international scientific journals, a board member of Researchers Club in the period from 12/2005 to 12/2009, a member of the Technical Committee of Agricultural and biological research Div. at NRC from 1/3/2014 to 1/3/2015, one of the founders of the Young Researchers Society and chairman of it in the period from 7/2010 to 3/2015. She obtained to appreciation certificate for 5th place in the research outputs, 2014, associate professor rank, offered by the national research centre. Dr. Ebtisam Eldardity has obtained her Ph.D. degree in 2001, Soil Science, Faculty of Agriculture, Moshtohor, Zagazig University, Sharkia, Egypt. She is a Professor at Water Relations and Field irrigation Separtment, Agriculutural Science Division at the National Research Centre (NRC) in Dokki, Cairo Egypt. Her field of specialization includes; water relation and soil Physics, improvement of hydrophysical and chemical properties of newly reclaimed soils, saline water reclamation suitability for agricultural reproduction. Some of her teaching experiences include vegetable production under slean agriculture, design of irrgiation systems in newly lands, and new technology for new reclaimed soils held in the Training Department of the National Research Centre, Egypt.